What does Athiya mean, details, origin, short & easy attributes? Origin: Similar names to Athiya: Athilda, Athira. Theme:cool. Gender: Athiya is normally a girls name. Athiya is baby boy name mainly popular in Hindu religion and its main origin is Hindi. Athiya name meanings is Lord Ganesh, Gift. People search this name as Athiya. Athiya is written in Hindi as अतिया. Other similar sounding names can be Aathi, Athier, Ithaya, Yathi. Each letter meanings in Athiya Name. Popular personalities with Athiya Name. 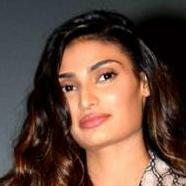 Athiya Shetty is an actor and actress. Their most notable accomplishments were from 2015 to present. Athiya was born as the child of Suniel Shetty and Mana Shetty on November 5th, 1992 in Mumbai, Maharashtra, India.